SMB Group recently wrapped up our “2014 Small and Medium Business Routes to Market Study,” in which we looked how U.S. SMB technology adoption and the buying cycle in ten key solution areas, as shown below. 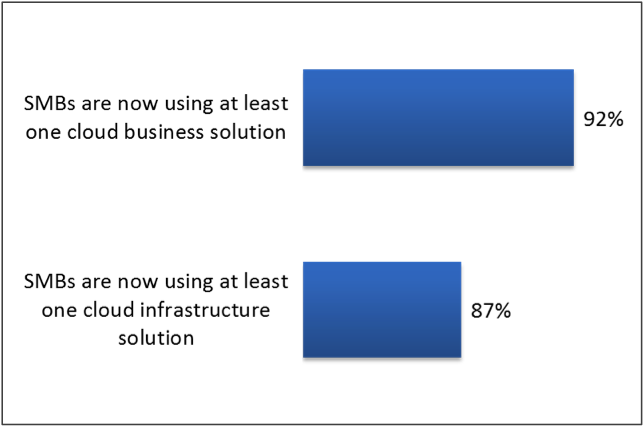 The most dramatic finding is that 92% of SMBs are now using at least one cloud business solution, and 87% already use at least one cloud infrastructure solution. (Figure 1). Furthermore, when compared with our 2012 Small and Medium Business Routes to Market Study, we see cloud adoption increasing in every solution area. For example, since 2012, SMB cloud adoption is up 10% for collaboration, 5% for business analytics and 2% for accounting and ERP. The same types of gains hold true for infrastructure applications. In addition, we see that as SMBs shift to the cloud, purchase channels are also changing to favor direct purchase from software or a software-as-a-service/cloud vendors and to managed service providers (MSPs). However, while the cloud has made it much easier for SMBs to access and use new applications, it has yet to do much to help SMBs integrate them. Although 63% of SMBs have at least partially integrated some applications, 79% still rely on manual Excel file uploads or custom code for integration, instead of using modern integration solutions or pre-integrated solutions (Figure 2). Integration is essential to helping SMBs reap the full business process value of new applications—and of course to gaining a more unified, consistent view of the business. 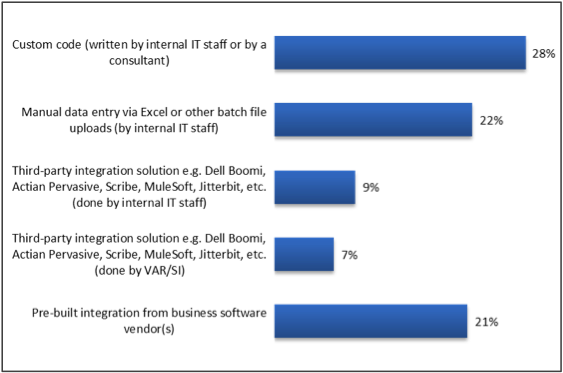 But as this research signals, vendors need to do a lot more both to educate SMBs about the value of application integration, and to make their integration solutions easier to use and more affordable. SMB Group’s 2014 Small and Medium Business Routes to Market Study assesses the entire SMB technology solution purchase cycle, including needs identification, information sources, advice sources, key selection and short-list criteria, and purchase channels. Fielded in February 2014, the study is based on the results of a 700-respondent web-based survey of SMB technology solution decision makers and influencers, and segmented into eight employee-size segments and 18 vertical industries. Pingback: What Services Are Included in Managed IT Solutions?